By Allan Fox: Promoter Eddie Hearn says he needs to know in the next 2 weeks if WBC heavyweight champion Deontay “Bronze Bomber” Wilder (38-0, 37 KOs) will be accepting his offer to fight his Matchroom Sport fighter Dillian “The Body Snatcher” Whyte (22-1, 16 on February 3rd at the O2 Arena in London, England. Hearn needs to know so he can start planning for that fight, as he’s already got the February 3rd date booked for the O2. If Wilder doesn’t let Hearn know in the next 2 weeks, then he needs to look for someone else to face Whyte on that date. Hearn said he’s going to “sweeten” the $3 million offer that he’s already made to Wilder for the Whyte fight. Hearn says it’ll be $4 million that Wilder gets with the addition of the U.S television money. He says he still has to pay Whyte as well his money. 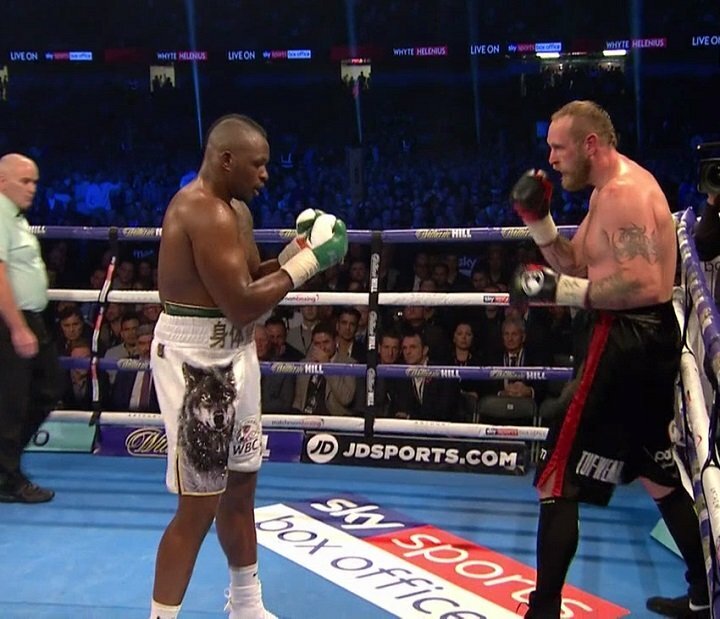 The No.3 WBC Whyte defeated Robert “The Nordic Nightmare” Helenius (25-2, 16 KOs) by a 12 round unanimous decision on Saturday night on the undercard of the Anthony Joshua vs. Carlos Takam card at the Principality Stadium in Cardiff, Wales. It wasn’t the most exciting fight by far on the card. Part of the problem was the 33-year-old Helenius was in the survival mode from round 3; moving constantly and leaning back to avoid the big shots from Whyte. The main reason why Whyte didn’t look good is because he was too one-dimensional and one-paced to turn it up enough to get Helenius out of there. Helenius was there to be knocked out if Whyte had been able to take the fight to him in a more aggressive way. Whyte was loading up with single shots all night long and not putting his punches together. Whyte didn’t look capable of putting his punches together in a sustained manner for him to stop Helenius. ”He’s going to box on February 3rd at the O2, whatever happens,” said Hearn about Whyte. “Ultimately, we want the biggest fight out there. The goal for Dillian Whyte is to get a title shot. It’s the number 1 priority. If he can’t get that, we’re looking at other options. Dereck Chisora is there as one of the options. There are not many opponents that are commercially viable outside of the unification’s. Dillian is right up there on the list. But the plan is to make that a unification fight. I’m trying to make the AJ-Wilder fight as big as possible, and I believe Dillian Whyte can beat Deontay Wilder. But I’m saying to Wilder, if you believe you can beat Dillian Whyte and you want to fight AJ, your status will rise much higher in a fight like that with Dillian Whyte. But obviously it’s a voluntary defense, and we’d be happy to give Wilder a rematch. We’ll see what he says in the morning. We need to know in the next 2 weeks if he wants to take the fight on February the 3rd in London,” said Hearn about Wilder potentially fighting Whyte. Listening to Hearn talk about how he believes Whyte can beat Wilder, I got the impression that he doesn’t actually believe that. Hearn’s face and body language didn’t match the words that were coming out of his mouth. He looked like he was being disingenuous. What else could Hearn say with his own fighter Whyte sitting right next to him. It would have looked really bad if Hearn told the boxing media that Whyte is being used as a pawn to help make the Joshua vs. Wilder fight a bigger affair. Wilder might now be interested in taking the fight with Whyte after seeing how bad he looked against Helenius. Whyte is wrong about Wilder not having the mobility that we saw from Helenius. Wilder moves a lot better than Helenius does. He’ll have an easy time eluding Whyte if he chooses to stick and move. Wilder is a lot more dangerous than Helenius though. Whyte was hurt by one of Helenius’ big punches in round 2. If the 6’7” Wilder can land his shots on Whyte, he’s going to need to have a strong chin for him to take those kinds of big shots. Even if Whyte can take Wilder’s huge rocket right hands for 12 rounds, it’s doubtful that the judges will give him the decision. Wilder, 31, will catch the eyes of the judges with him connecting on huge right-hand shots. Wilder is clearly a much bigger puncher than Whyte. “You know the offer. Maybe there’s a little more juice in the offer. I believe there’s not anyone else the broadcasters for his network want to see him fight outside of Anthony Joshua,” said Hearn. ”They’re not interested in paying a lot of money for [Dominic] Breazeale. At the end of the day, he’s already been offered $3 million plus U.S TV, perhaps $4 million in total. He’s making $2 million per fight. He might have watched the fight tonight, and think, ‘I’ll go.’ Hopefully, he does,” said Hearn. Wilder might not take the fight with Whyte if he continues to see it as a useless detour to the important fight that he wants against the 27-year-old Joshua. That’s the fight that Wilder really wants, because it will bring him both money and fame. Wilder will make a ton of money fighting and beating Joshua. Wilder won’t make nearly as much money fighting Whyte. A victory over Whyte does very little for Wilder other than giving him $4 million. It’s an unnecessary risk for Wilder. “I was expecting a fight, but he didn’t come to fight. He’s a tricky guy,” said Whyte to IFL TV about Helenius. “He carried his amateur movement over to the pros, so he’s very tricky. He was long and rangy. So he gave me something to deal with. He kept hopping 3 steps back each time I got close to him. I had to be mindful of his right hand. When someone wants to survive, it’s difficult. He can beat a lot of guys. That guy can whack, you know? He said he’s a Viking, but he didn’t show no Viking in there. I said you’re a Viking, let’s fight, but he didn’t want to fight. He wanted to survive. He didn’t want to get beat up. He wanted to get his money. His nose is still straight. If I got Helenius out in the 1st round, Deontay Wilder would want no part. The difference is Deontay Wilder will stand there and try and throw. He’s not a good boxer, so he won’t try and move around the ring as well as Helenius. It would be a different story. Helenius is a little bit more tricky. In another 2 or 3 more fights, I’m there. In another 3 or 3 more fights, I’ll have all the seasoning and I’ll be there. I thought he was coming to fight, but he didn’t fight. He landed a good punch in the 2nd. I wasn’t really hurt, but it made me reassess the situation,” said Whyte. Whyte is blaming Helenius for using his boxing to elude Whyte. When you look at the fight, Helenius wasn’t using a lot of movement. He was moving slowly around the ring. The problem was that Whyte was too slow at cutting off the ring on Helenius to force him to brawl with him. Whyte also struggled with Helenius’ height. Whyte couldn’t get to Helenius with his punches, because he would lean away from him to avoid getting hit. If Whyte straightened out his punches, he would have landed more shots. The main problem for Whyte is he had slow feet, and couldn’t cut off the ring. “If Dillian had knocked him out in the 1st or 2nd round, he [Wilder] might not want to fight him,” said promoter Eddie Hearn. It’s possible that Wilder would have been worried frightened off by a fast Whyte knockout. We don’t know if Wilder intends on taking the fight with Whyte now. He doesn’t see it as a fight that he feels is needed. Hearn says Wilder will increase his name value in the UK if he beats Whyte, but it seems more like a self-serving move on the British promoter’s part. He’s got a fighter in Whyte whose popularity will be increased by fighting Wilder. Whyte gets a lot more out of the Wilder fight than vice versa. It also gives Hearn a chance that Whyte could possibly win the fight. That’s his fighter, so it helps Hearn, but definitely not Wilder. “I think Helenius is technically the better boxer than Deontay Wilder,” said Whyte. Whyte will be in for a big surprise if he does fight Wilder, and he finds out how good the Bronze Bomber’s boxing skills are. If Whyte was having problems with Helenius’ technical skills, just wait and see what happens when he gets inside the ring with Wilder. It’s going to be a lot tougher. Helenius was exhausted after 3 rounds. That’s something that Whyte didn’t talk about. Wilder won’t get tired. He’s quite capable of fighting hard for 12 rounds, and throwing with huge power deep into the fight. If Whyte is still standing in the later rounds against Wilder, he’s likely to be punch drunk by that point in the fight. “It was a good performance from Dillian,” said Hearn. “It wasn’t a blistering performance. Therefore, it might work to our advantage. Deontay is fighting next week on Showtime and Sky Sports, defending his title. We’re ready to go on February the 3rd at the O2. We got it booked. I spoke to Stephen Espinoza about it. He’s going to talk to Al Haymon about it. If they make the fight, and if Deontay Wilder will travel, then it’s an easy fight to be made on February the 3rd. He can’t make that money in America. We’ll pay double the money to do the fight in London,” said Hearn. We’re going to see if Stephen Espinoza can persuade Wilder’s adviser Al Haymon to take the fight. We’ll have to see if he can. It’s going to come down to whether Wilder wants the fight or not. I don’t think he’s going to be persuaded to fight Whyte if that’s not what he wants to do. It’s good that Whyte wants to take a dangerous fight against Wilder, because he really doesn’t need to take that fight. Whyte can get a title shot against Joshua even without fighting Wilder. Whyte obviously wants to increase his value for the Joshua fight by beating Wilder, and winning his WBC title. There’s big difference between Whyte going into a rematch with Joshua as the WBC heavyweight champion compared to him fighting him as a challenger with no title. “I think he started really well,” said Hearn about Helenius. “I think he won maybe the first 2 rounds, but then he started to get hit a little bit, and I think he decided he didn’t really want to be in the fight as much. He tried to box off the back foot, trying to survive. It’s really hard to look good against someone that’s trying to survive. Obviously, Dillian got flustered a little bit and smothered his work, but when someone’s running and they don’t engage, it’s very difficult to get them out of there. I‘ll expect the IBF to call a final eliminator between Dillian Whyte, and It’ll probably be against Jarrell Miller if he beats Mariusz Wach to become Anthony Joshua’s mandatory. It’s a mandatory, which will be due next September, next year. I think he can have a final eliminator with the WBC. I think he can have a final eliminator with the IBF. I think he can fight Deontay Wilder. There’s obviously Lucas Browne,” said Hearn.